I get asked this question every week. In today’s often price-driven economy, some individuals base their decision on price so it is understandable that I am often asked this question. The answer again is, “It depends.” It all depends on what materials you are putting in your house and how complicated the design is. Is it for a rental unit, or the home of your dreams? What does the land look like? Are you on a hill? Is the area easy to get to? How is the ground? Will there be a lot of foundation work? What kind of roofing material are you using? I tell everyone to be careful asking about a square foot cost and/or making contractor selections based solely on square foot cost. For example, cabinets can cost $150 box, or $1,500 a box. What kind of cabinets are you getting? What kind of flooring, what kind of windows, countertops do you want? Everything varies on price depending on quality and brands. Every contractor offers different values. Some cut corners to be the cheapest, some are customer service oriented and some are not. Please remember to interview and get lots of estimates from different contractors and determine which contractor offers the value you are looking for. Do not base your decision solely on price. I understand that price is always a big factor—just don’t make it your deciding factor. (If it is for a rental unit, perhaps the lowest bidder is more appealing.) Do your homework…maybe the lowest bidder renovated your friend’s place and they loved them. Hey, then you win!! The best advice I have is to figure out what you want, and get a good idea of the cost of finish materials before you ever sign a contract. Companies with the lowest price often bid low in an attempt to get the job. They are trying to present themselves in a way that their price seems good. Is it ethical? Is it fair? Maybe, maybe not? To protect yourself, it is your job to do your homework before you sign a contract. Go to a store and see if you can pick out the material you want for the money they have in your finishing allowances before you give the contractor any money. Educate yourself to protect yourself. Do your homework, ask lots of questions and figure out everything before you pick your contractor. As a solution, it is a good idea to get prices without the finish allowances in the bid. That way you will have the opportunity to spend what you want on finishes because you already know the cost of the structure. Some of you are thinking…I don’t know anything about finishes. If that is the case, go to different stores and start getting some pricing. Look and see first-hand what cheap cabinets look like and cost. Do the same with flooring. Determine if you like the cheap stuff or the nicer stuff. Have this determined before you even start talking with contractors. I find that, most people, if they have not spoken to any contractors, are way off on what their project will actually cost. The average person in Hawaii is clueless to what construction costs here. Hawaii is one of the most expensive places when it comes to construction. Material is expensive and so is labor. If you don’t know anything about construction, your might end up costing about 2-3 times what you are thinking. For renovations, I frankly believe that it is too complicated to rely on a contractor giving you a square foot price. Additions and renovations cost a lot more per square foot to build than new homes. With additions and renovations, you have to protect the portion of the home you are keeping and demolish the section that will be changing. You might have to jackhammer and trench through your existing concrete in order to run your plumbing and electrical to the new areas. You may need to trench the yard to get to the main sewer line, or power source at the front of the house. You may need to rip up parts of your driveway to do this. All of this results in a unique cost for your unique circumstances. 1) First, you have the demolition phase. It can take anywhere from a day to a couple weeks of demolition, and preparation to get your home ready for the new build. 2) If you are going to be pouring concrete, they will need a few weeks or so to complete their portion of the project. 3) Then your framing crew comes in and builds the bones of the structure and usually puts in your walls, windows and siding. 4) Next phase is the plumbers to do the rough-in. They can take anywhere from a day to multiple weeks depending on the scope of work. 5) Next is the electricians, then the drywall crew. 6) This is followed by paint, and the finishing team. The finishing team installs cabinets, flooring showers/tub, tile, and doors, trim etc... Once the cabinets go in, the countertop fabricator comes to template your countertops and it will take the fabricator approximately 2 weeks until they come back and install it. 7) After that, plumbers and electricians come back to install all the final fixtures. The construction crew will conduct a final inspection and “clean up.” This final process takes about a week or two to wrap everything up before your home will be yours again. There are tricks to getting your project done faster. You can have all the tradespeople working at the same time. Most tradespeople don’t like to work on top of each other; however, they usually know it happens from time-to-time and comes with the job. To save time, you could also install your flooring while you are waiting for countertops. This is a good option if you are installing porcelain tile (because it is so durable and won’t be affected by the construction workers walking on them). However, we typically like to wait until everything is complete before we install the floors—especially if we are installing wood, vinyl or carpet. We want the home owners to be the first ones to walk on their floors instead of a bunch of construction workers walking on the new floors. Regardless, for some people getting the job done is a priority. In these circumstances, we make exceptions and do whatever we can to accommodate the clients’ needs. In sum, having a contractor that is organized, has a good plan and a firm schedule is the best way to get your job done quickly. From the client’s perspective, don’t change your mind or add things if you want your project done fast. Make sure to have all your materials ahead of time, have a good plan and a good contractor, and your project will go swiftly. The majority of people I meet have no idea how long a project takes. When asked this question, my most common reply is, “It depends.” Every project is different. Every home is different. Will you be renovating an apartment? Your home? Is your home two stories? Is your home on a concrete slab or is your home built on post and pier? Will you be living at the project during construction? This article will give you some information that will hopefully help you have a better understanding of how long your project will actually take to complete. In Hawaii, the majority of building supplies must be shipped here—cabinets, windows, plumbing fixtures, and tile usually take 6-8 weeks to come in. The best way to get your project completed fast is to have everything selected before you start, don’t change things mid-way, and have a good plan. Ask your contractor lots of questions to make sure they are on top of everything, and have a clear schedule in mind. We do lots of kitchens and bathroom renovations. In Hawaii, due to the cost-of-living, most of our clients are living in the home during the renovation. I have found that it is in everyone’s best interest if we can get out of their home in under two months. The first month people are excited, the second month the stress levels start to build and the third month people tend to “break.” (It may not sound very nice to say people break, but this is the harsh reality. It is extremely stressful not having a working kitchen or bathroom. Living in a half-built house with a bunch of strangers in there can be overwhelming to some people.) We consider ourselves unwanted guests in people’s homes, and do everything to get in, do a quality job and get out as fast as possible without cutting corners. Moreover, if we can get out of someone’s home fast, they usually like us better, and have nicer things to say about us to their friends. New homes can take anywhere from six months to two years to complete. There are definitely extremes on both ends of the spectrum. A typical home can be built in roughly 11 months. A simple single-story house can be built and completed in three months or so, though this is not typical. If you have a small home on flat ground with easy access, you can be looking at maybe six months if your contractor is good. On the other hand, some “extreme” homes and large mansions can take three or more years to complete. As ADUs and extended living are popular in Hawaii due to the high cost-of-living, many of our clients are interesting in building additions or ADUs. How long will the construction take for these additions? Again, it will depend on many different variables. How complicated is your addition? A safe estimate is six months, though it really depends on the job. There are many different tradespeople involved in an addition, and many phases. Additions are usually more complicated than a new build because you have to work around existing structures that have to blend together with the new. What about remodeling a kitchen or bathroom? I usually tell my clients to expect their bathroom to take six weeks. Kitchens typically take 8 weeks. For both the kitchen and bathroom, the countertops really add to the length of time on a project. If you are using an off the shelf bathroom vanity purchased from Home Depot, you can knock off 2 weeks because you won’t have to wait for custom countertop fabrication. On a side note, a lot of people think that they can redo a bathroom for $10,000.00. Yes, it is humanly possible, though not likely. You can get a cheap vanity, a cheap tub and plastic surround, cheap plumbing fixtures, and cheap flooring and use a handyman or cheap contractor. However, if you are using a licensed experienced contractor, just redoing your shower could cost you $10,000.00. (Believe it or not, that’s on the cheap end.) High-end, luxury bathrooms can cost as much as kitchens, as plumbers are expensive. The first question I would ask yourself is “do I need a general contractor?” If it’s a real small project, a handyman might be the right way to go. Hawaii state law requires you hire a licensed general contractor for any project that costs over $1,000.00. Hiring a General Contractor gives you peace of mind because (a) they are licensed professionals overseen by the State of Hawaii and (b) they are required to be licensed and carry a decent amount of insurance. This gives you added protection and a safety net in case they burn down your house or skip town. What type of contractor should I select? What are the different different types of contractors? There are flooring contractors, roofing contractors, painting contractors, drywall contractors and so on. If you are only doing flooring, then maybe a licensed flooring contractor is the right choice for you. These are specialty contractors that do one thing. General contractors can help you with your entire project. They are the conductors of the orchestra. If you are doing cabinets, countertops, plumbing, electrical, and flooring then you will need to hire a licensed general contractor. They will be able to manage your entire project. Licensed general contractors are required by law to use licensed specialty sub-contractors like plumbers and electricians. Some general contractors are basically a one man-show that do most of the work themselves. This can be good and bad. If they are a one man show they will probably be a lot less expensive, which is good. However, the “cons” of hiring a general contractor who is a one-man show is that (a) it will likely take a lot longer to complete your project, (b) they might not carry as much insurance if something goes wrong, (c) they sometimes bite off more than they can chew, and (d) a one-man show may take on too many jobs at once and have to bounce around from jobsite to jobsite, leaving their clients wondering where they are and if their project will ever be finished. Most contractors start off as a one-man show and then slowly grow. If something should go wrong on your project, it can be hard for a one-man show to make it right with the clients. A larger company can afford to take a loss and make it right for the clients. For people that want a lot of hand holding on a project, a one-man show might not be able to give you the attention your project may desire. Furthermore, there are companies that compete solely on price. A lot of people want to hire the lowest bidder. This is not always the right choice. Some general contractors sub-contract everything out to the lowest bidder, and just manage the project. Others do everything in house. Most fall somewhere in between the two. I find it impossible to control quality if absolutely everything is subcontracted out to the lowest bidder. However, some people are not that concerned about quality and just want the lowest price. For this type of client, a general contractor who sub-contracts everything out to the lowest bidder would be perfect for them. Contractors like this, have a low overhead and can provide lower pricing, than other contractors that focus more on service and quality. We do the majority of our tasks in-house. That said, certain tasks should be sub-contracted out to specialists. Moorhead & Company does not hire the lowest bidder. We work with the same subcontractors over and over again. We have built an amazing team of sub-contractors that aligns with our values. Our sub-contractors know what we expect from them. They provide exceptional quality and professionalism every time. They are usually more expensive than a lot of the other cheaper companies that compete solely on price. Our company focuses on extreme customer service and quality. Our clients are not looking for the lowest bidder. Our clients want to hire a company they can trust that offers fair price for a high level of service and quality. For that reason, we find that the majority of our clients are individuals who will live (or are living) in the home. This is a question that I hope everyone thinks about before they start their kitchen and bathroom remodel. Every circumstance is different. If you are fixing up a rental unit, you probably don’t need to hire a designer. If you just need a cheap repair, you definitely don’t need to hire a designer. If you know exactly what you want, you probably don’t need a designer. Before you start your project, take the time to figure out what you like. (Sometimes it can be easier to figure out what you don’t like before you decide what you do like.) A designer can help you do this. 1) You will see it day-to-day because you will live in the renovated home. 2) Your kitchen is the focal point of your home. 3) You have always wanted a dream kitchen and/or bathroom and now you have the money to build it. 4) Your goal is to raise the value of your home. Designers add cost to the project, and some are very expensive. Are they worth it? It depends on the designer, depends on the project, and it definitely depends on your neighborhood. If your goal is to increase the value of your home, you definitely don’t want to overspend what your property will be worth. It’s a good idea to talk to a real estate agent that you trust before you start your project. Find out what the upgraded homes in your area are going for, and then you will have a better idea of what is the right budget for your project. If you live in an area where there is money to be made on a nice upgrade then you know it’s a good idea. You don’t want to spend money on your home renovation if you will not get your money back on the new value of your home. What other value can a designer bring to my project? Designers know where to get good stuff at good prices. Designers can listen to your vision and bring it to life. They will be able to provide you with photos and samples, and work together with you to make your dream come to life. Most of them can provide everything that you are looking for. A lot of them are distributors and can get you great prices. They have relationships with vendors, and get better pricing than you. Hiring a designer can easily add 1 to 8 grand to a project, but it doesn’t half to. It really depends on the size of the job. That said, the increased value you have just added to your home is usually worth it. The peace of mind you will have from working with a professional can be priceless (assuming that there was clear communication between the client and the designer). A year later, after the burn from spending all that money simmers down a bit, people are usually happy they hired a designer. Designers can also help to recommend a good contractor (like us). Does it have to be really fancy project to hire a designer? The answer is no. All designers are different. 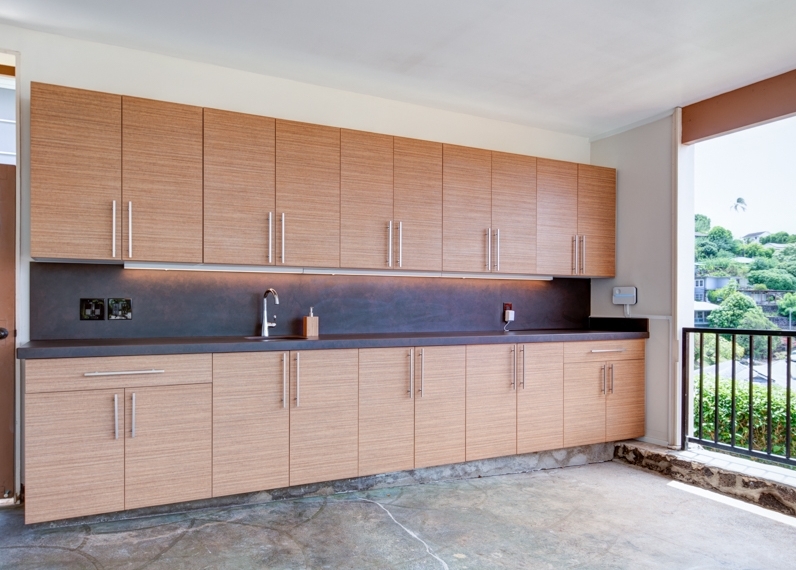 Lots of distributors that sell cabinets have a design fee built into the cost. Some designers will come out for a couple hours and give you advice on how to lay out your kitchen and others will give you full architectural drawings of your project, provide you with everything, and hold your hand throughout the entire project. What are the different countertops and which one is right for me? There are many different types of countertops to choose from; Butcher Block, tile, stained and polished concrete, Hard Wood, Formica, Corian, Granite, and Quartz are the most common. The vast majority of the kitchens we do now are either Granite or Quartz—and almost 75% of our clients choose Quartz. The major difference is Granite is mined from the earth and polished—each piece is unique in color and grain. Quartz is man made and has a very specific style, color and pattern. Quartz is more robust and requires lower maintenance. Granite is a natural stone and thus porous and prone to gathering dirt. Granite will need to be maintained (including polishing and sealing—at least once a year). Both are extremely hard, are scratch resistant and age well. Some clients love the artistic nature of natural stone and are OK with the maintenance required to preserve it's natural beauty, while others prefer the low maintenance, style and design of quartz. Moorhead will make sure that no matter what you choose, it will be built beyond your expectations. Making sure your tub to shower conversion doesn't go down the drain. The most common thing we are doing these days in bathrooms is what is known as a “Tub to Shower Conversion.” What this means is replace where the bathtub used to be with a shower. Years ago people thought that they needed to have a bathtub, in order to maintain the value of their home. This doesn’t seem to be the case as much these days. (I am not a realtor, so please check with a realtor before you take my word for it). Also, as the “Baby Boomers” get older, bathtubs aren’t as popular as showers are. Should I do a Tub to Shower Conversion? Do you use your bathtub is a question I would ask myself? If not, I say get rid of it. What is the cost difference between installing a bathtub and installing a shower? Every job is different though there isn’t a major price difference between the two typically. It definitely will depend on if you already have one or the other. It will always be cheaper to replace a shower rather than build a new one. The drainage location and PVC sewer pipes differ between showers and tubs. You are either paying for the bathtub, and installation of the bathtub, or the additional tile work. The cost varies a lot from jobsite to jobsite as to what removing a bathtub and installing a shower will cost. The truth is, it depends on if your floors are wood or concrete? Are you in a house or an apartment? If you are in a house. Is it the first or second floor? Is your floor made out of concrete or wood? If concrete, you may need to jack hammer to move the location of the drain. If it is the second floor, you may need to do drywall and paint work on the ceiling of the room below. There are many different variables to consider. Some apartment buildings require you to do your plumbing work involved with the shower drain from the apartment below. Even worse, some apartment buildings give the owner of apartment below the option to allow you in their home or not. This should be discussed with the building before any decisions are made. As people get older, it is harder to get in and out of a bathtub. Showers are much easier for many people. This is another reason why “Tub to Shower Conversions” are popular. We do a lot of what we call “Aging Gracefully” projects. Basically we are designing bathrooms that anticipate future needs of our clients. We are building walk in shower’s where bathtubs once were. We make the curb as short as possible. How short, depends on the what the space will allow. We install backing for grab bars throughout the shower and bathroom behind the tile in preparation to when people will need grab bars they can install them without worry. We also frequently install seats or benches in the Showers. Your kitchen backsplash is a major focal point. Here is how to get it right. A kitchen backsplash can really make your kitchen stand out. It all comes down to taste. The most common one being a simple 4”, or 6” backsplash made out of the same surface material as your countertop. The other most popular options are tile or a solid surface like your countertop. You can do a lot with Tile. There are infinite ways to tile your backsplash. You can do ceramic or porcelain subway tiles. You can do glass subway tiles. You can do porcelain with glass mosaic tiles. If you want to completely customize your backsplash, tile can be a great option. What is the draw back to using tile as a backsplash? Care and Maintenance. The smaller the tile, the more grout lines to keep clean, and seal. A lot of people do not realize that you are supposed to seal the grout between the tiles. If a tile backsplash is properly cleaned, cared for and sealed, it shouldn’t stain. If you are a messy chef, and someone who gets sauce all over the kitchen, a tile backsplash might not be right for you. A solid surface like Granite or Quartz, is easier to clean than tile. If you go with Granite you will need to seal it once a year with your countertop. Quartz is the lowest maintenance of the three. Granite and Quartz countertops are usually sold by the slab. Sometimes you end up with a lot of left over material due to the shape and size of your cabinet layout. You can do a few things with the left over material. You can use it in a different part of your home, like a bathroom, window sill, desk etc.. Or if you have enough you can do a full backsplash. I usually advise my clients that if they have enough Granite or Quartz left over to do a full backsplash. Do it. It usually isn’t that much more expensive than the cost of the counters, and you have already purchased the material. Unless money is not an option, it usually is the best “bang for buck." Bright ideas that make a big difference. The first thing people usually cut from their budget is lighting. Unfortunately, this can be the difference between having an ok kitchen, and having a “WOW” Kitchen. Lighting adds character to a kitchen. Designed properly, lighting can set the mood for an entire home. The vast majority of people spend most of their budget on Cabinets, Countertops, Labor, and Appliances. While of these are important in making your kitchen comfortable—lighting makes the difference. There are several unique ways to use lighting in a kitchen. Recessed lights are very popular right now, and the white simple 4” LEDs are my favorite. They can be dimmed to set different atmosphere’s. Pendant lights are great over an island or a peninsula. There are thousands of different styles to choose from, to fit anyone’s style and taste. If you're on a budget, consider track lighting that doesn't require re-wire the ceiling, in order to keep the budget down. Then there’s under-cabinet lights—these are my favorite way to take a kitchen to the next level! The way to really make your kitchen pop is with a high quality backsplash that creates a rich focal point, and under-cabinet lights to set off the details. If you're looking for you next bright idea, Moorhead always builds beyond your expectations.